Dolphin House is located in Moggonisi, Paxos. Our detached vacation rental property is air-conditioned and sleeps up to 7 people (6 adults and 1 child) with 3 bedrooms, 3 bathrooms along with private swimming pool and sea views. The Villa is walking distance to the beach. Dolphin House has has 3 air conditioned bedrooms. If an additional bed is required there is 1 folding bed. The villa can sleep up to 7 people. The large swimming pool, faces South, and has beautiful sea views. The pool is for the exclusive use of Dolphin House only and it is incedibly large. With excellent beaches just below the villa and the sandy beach just opposite you will be spoilt of choice! Equipped with large umbrellas, sun beds and chairs, and with a cool stone-tiled terrace all round, this is a magical spot for a swim, whether you like a lazy float or a calorie-burning sprint, and moreover it will be hard to take your eyes off the views, that stretch as far as the neighbouring island of Anti-Paxos. Had a super holiday, just rebooking for 2019, although hoping the owners might take onboard the feed back. I have reported this twice before after we stayed in Dolphin Villas but nothing has changed. 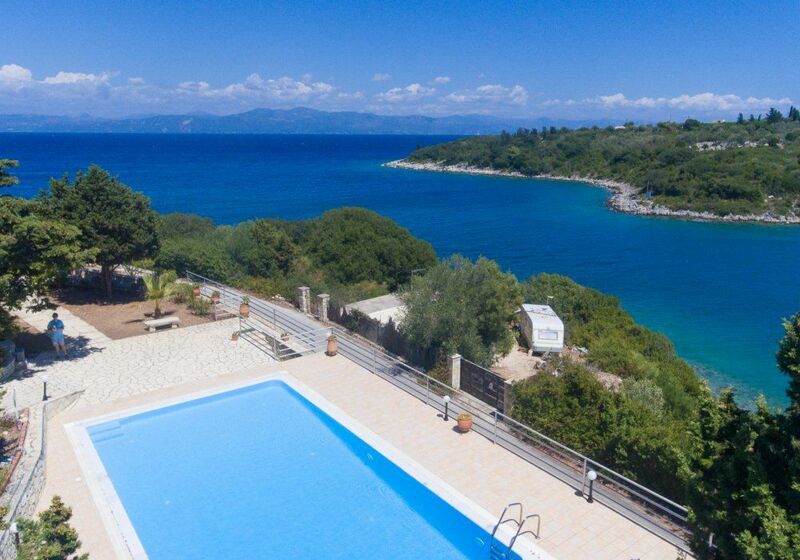 The villa is comfortable with truly stunning views over beautiful Mogonnisi bay. We had a wonderfully relaxing holiday, swimming every day in the beautiful pool and occasionally walking across to Mogonnisi beach and going in the crystal clear sea. We relied on taxis into Gaios which worked well, although it is a shame the bus service doesn’t include Mogonnisi. We took the bus to Lakka, visited Antipaxos and hired a boat for the day which we thoroughly enjoyed. All in all, a great holiday. We would like to take this opportunity to thank you for taking the time to complete feedback for Dolphin House. Second stay at this property, very peaceful with a wonderful view. Garden and villa are very well maintained. Linen and towels are always spotless as is the villa inside. We booked this as part of a Greek getaway for two parents, two adult children and their partners. This was a perfect break, the setting is idyllic and the pictures don't really do it justice. We stayed for 5 nights before continuing our journey to some other islands. The younger people stayed upstairs in two bed two bath apartment, we the parents stayed in the ground floor apartment. Accommodation was perfect and very clean. The pool was a great size and for sole use for Dolphin House. Very peaceful location. It is a 45 min stroll to town along the coast or you can walk inland which takes 25-30 mins. If you prefer not to walk a taxi is between 8-10 euros one way. We all agreed we will go back to Dolphin House which for a family who travel a lot but never go back to the same place twice, says a lot. We had a lovely relaxing stay at dolphin villas, it was our honeymoon so after all the organising and stress it was the perfect romantic getaway.